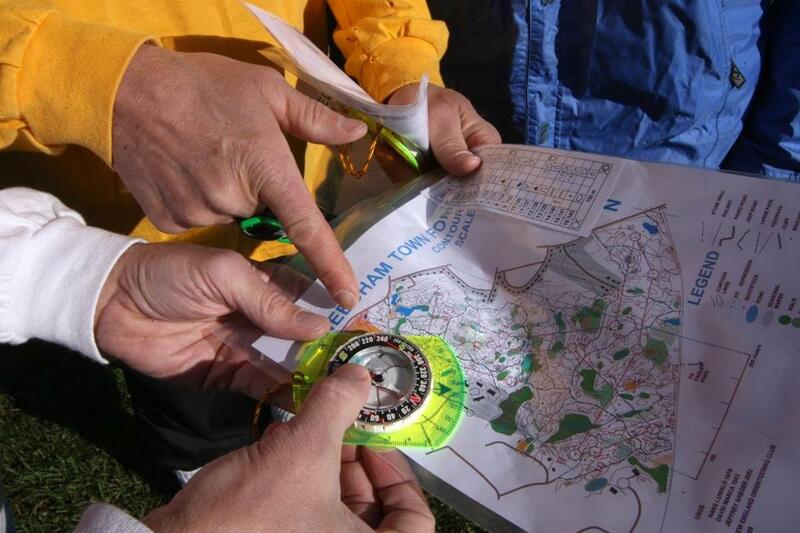 Members of the New England Orienteering Club checked their map and compass before heading out on the course. NEEDHAM - Bill Spierdowis double-checked his contoured map as he ambled through the Needham Town Forest on a beautiful fall afternoon with his wife and a friend. “Is this the one we crossed?’’ said Spierdowis, 60, from Foxborough, looking at his map and then at a narrow stream that trickled through this 190-acre thicket of trees, brambles, brush, and boulders. “It either is or it isn’t,’’ answered Kathy McArdle, a friend who followed Bill and Sandy Spierdowis as they gingerly picked their way along an advanced beginner course laid out by the New England Orienteering Club. For the neophyte, orienteering is all about mistakes - and learning from them. Unless the novice committed all of his or her Scouting skills to lifelong memory, trying to pick one’s way through the bumpy underfooting of unfamiliar woods can be embarrassingly daunting. But the satisfaction is as palpable as accurately reading a map to spy a rock, or cliff, or marsh among the confusion, colors, and camouflage of the forest, and then using that clue to tramp to one of a series of markers that form an orienteering course. On this recent Sunday, 112 people trekked to Needham for an event with five courses ranging in difficulty from leisurely beginner to devilishly complicated. For the best competitors - and it is a competition for them - the goal is to scamper through the woods as quickly as possible to locate about a dozen markers placed in hidden or obscured places. But for those who enjoy a simple but challenging walk in the woods, running is not required. Others, however, relish the experience. That kind of frenzied focus seems second nature for veteran orienteers, as they call themselves. They appear to read tiny dots, lines of dashes, and subtle shadings on custom-made maps as easily as Boston commuters decipher towering exit signs in bumper-to-bumper traffic. Each competitor is equipped with a plastic “stick,’’ which fits over a finger and is thrust into a computer-linked slot at each marker. The orienteer’s time is recorded - both cumulatively, from the start of the event, and intermittently, since the previous marker - to ensure that all checkpoints are reached in this think-on-one’s-feet treasure hunt. Orienteers usually leave individually, in roughly staggered starts, to avoid taking advantage of the detective skills of others. For “advanced beginners,’’ such as this reporter, the nearest “competitor’’ on my 11-checkpoint course was nowhere in sight. I was on my own and paid the price for not paying better attention as a long-ago Boy Scout. I finished 16th out of 17 on a course of 2.6-kilometers. The time: 1 hour, 54 minutes, 36 seconds. To put that time in humbling perspective, I once needed only 43 more minutes to run the Boston Marathon. But, in the marathon, the course is never in question. In orienteering, the best way to get from point A to point B is up to the snap judgment of each person holding a map, reading the terrain, aligning a compass, and setting out - as quickly as possible. That means orienteers can come to different conclusions about whether the best route is to the east or west of a troublesome knoll. Success comes through instinct, experience, and skill - all of which were tested in the suburban wilds of the Needham Town Forest. The sport lends itself to national and even global travel. Orienteering is much more popular in Europe than the United States and often draws tens of thousands of enthusiasts to multiday events in places like Scandinavia. “From a family point of view, we have traveled all over the country doing this,’’ Saeger said. And there are opportunities close to home. Today, a 13- to 14-kilometer advanced course with a mass start will be held at 11 a.m. in the Blue Hills Reservation; a meet on the recreational courses there will begin from 10 a.m. to noon. Next Sunday, a meet for varying levels, from novice to advanced, will begin from 10 a.m. to noon at the Harold Parker State Forest in Andover. The sport attracts many academics and intellectuals, as well as people who work with their hands, Tong said. The age range spans the generations from children to octogenarians and beyond. The meet director at Needham, Jeff Schapiro, 51, is an emergency-care physician who works overnights in East Boston. Schapiro obviously loves the sport, because he spent four days in the forest, for three to five hours at a time, setting up the courses. It’s a rigorous job, and not only because the maps must be meticulously prepared, checked, and can cost thousands of dollars to produce. Saeger said he enjoys the social aspect of the events, and that the wide age range of the participants helps keep him young. It’s also a tantalizing way to introduce longtime urbanites to the outdoors. 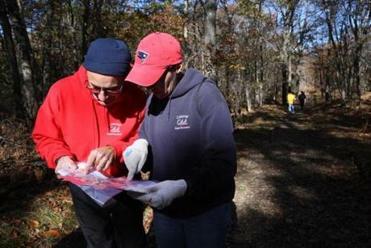 Barb Bryant, a member of the club’s board, has volunteered with the Cambridge public schools to use orienteering as a way to teach teamwork and map-reading skills. This year, more than 140 fifth-, seventh-, and eighth-graders ventured into the woods after some classroom preparation. Once in the woods, however, the sport becomes a compelling mix of brainpower, fitness, decision-making, and a chance to appreciate nature all at the same time - if there is time, that is. For the top orienteers a great time in the woods is the fastest time possible. Events are held rain or shine at various locations in the area. Courses range from beginner to advanced. Instruction is generally available.